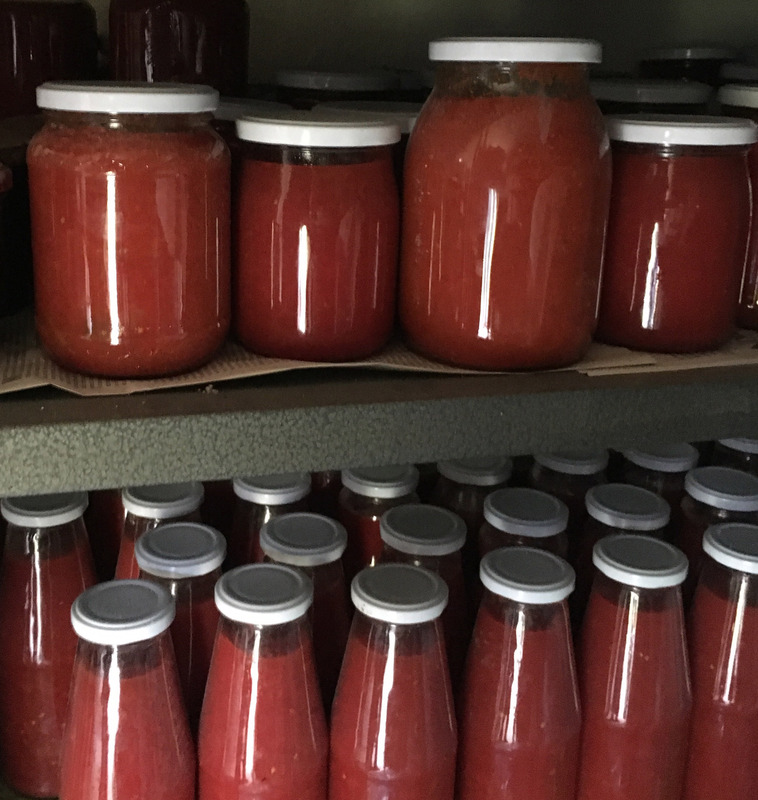 Not all of us have a ready and waiting larder packed with bottles of sun-drenched pera d’Abruzzo tomatoes that have been squished into passata ready to make a wonderful pasta tomato sauce better known as sugo in Abruzzo. 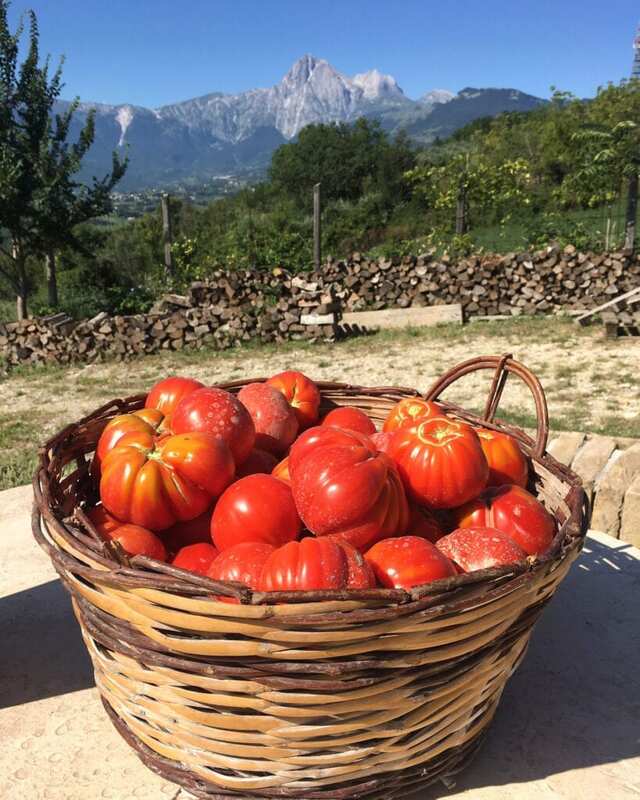 We try hard to recreate the flavours of Italy but those tasty tomatoes whose seeds are passed on from generation to generation are hard to beat. To the rescue comes Annamaria, who I recently stayed with and who shared what to do with dreary tomatoes, especially when spring is in the air and herbs are no longer just plain woody but with visible new tender leaves and added pungency. I may not have the best tomatoes but her added cornucopia of herbs makes any base of dreary tomatoes burst with an aromatic flavour and life! We tried her sugo cooked with some of her memorable polpettine di ricotta (fried ricotta balls), utterly delicious! Annamaria used to combine working with her husband on their former dairy farm just outside Cellino Attanasio in the province of Teramo with being a weekend cook at local agriturismi. Their B&B is still a farm but, in a nod to retirement they gave up their milk herd and now just raise beef and olive oil. Of course she has amazing tomatoes, with bottles of passata and ‘sugo pronto’ that neatly fill a casetta (little house) next to her hens. What’s interesting in here is the brown boxes full of those bottled tomatoes ready for their sons to take back with them to northern Italy where they work, lucky boys! Cook all of the sugo ingredients together on a high heat for about 30 minutes. After cooking remove all the herbs, turn off the heat and add 3 basil leaves. Stir the pasta in the sauce for 5 minutes on a very low heat and add a little cheese to give it a slightly saltier taste. During summer you can also add a piece of peperoncini (chili pepper) during the cooking with all the herbs. Life in Abruzzo I’ve been there many many times. The area around Cellino is breathtaking. It’s in my Nonna’s recipe. Is aromatic sugo an ingredient or the name of the recipe! I do not refrigerate my tomatoes ever. In the winter I use the plum tomatoes , and supplement with canned if needed. In the summer I use my own home grown. My freezer right now has a supply of marinara, bolognese and meat sauce. Why do you call tomatoes dreary? Dreary means lifeless and depressing. Tomatos are never dreary except in the winter when they’re just plain tasteless! And you can’t make sauce from winter tomatoes. Life in Abruzzo Ah, thank you for your response! Yes tomatoes in winter are awful, especially where I live in the Northeast US where they have to be shipped across country from California or up from Florida, they have no flavor at all. Canned is all we get in winter. Thank you again for your response. Maria Ventresca Bennett Do they refrigerate fresh tomatoes in the US when they get them home like the UK?